The tank of VNC-6 is 4 mm, and the tank of VNC-8, VNC-10, VNC-12,5 and VNC-16 is 5 mm thick and covered with anti-corrosive paint. The tank has two 2'' windows in diameter, 3 flanges (on both sides and rear position), 6-meter PVC pipe Ø 150 mm (6''; model VCN-6 4'' or Ø 101 mm) and clamps to secure the pipe, mechanical safety valve for side openings and hydraulic safety valve for rear opening, Ø 150 mm (model VCN-6 Ø 101 mm), two loading slots Ø 550 mm (top and rear). 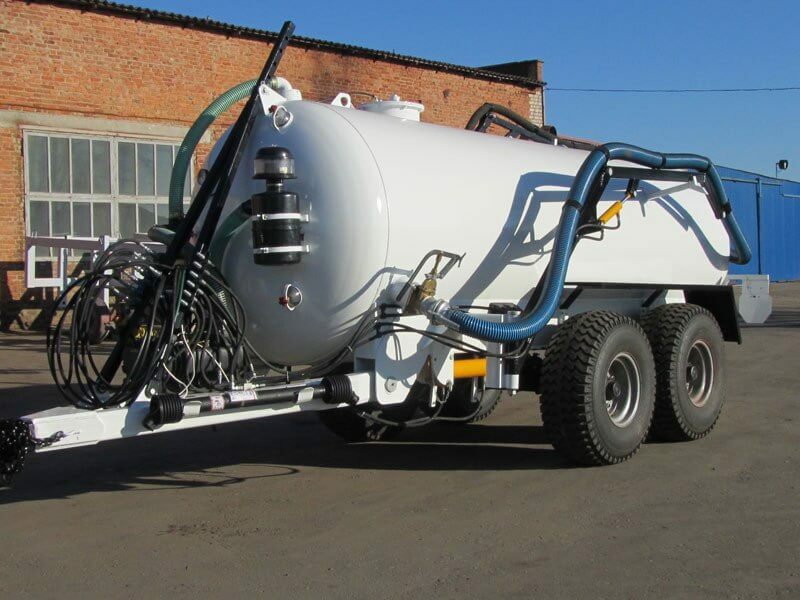 The tank is equipped with an automatically lubricating vacuum pump MEC 8500 (8 500 l / min), pressure, vacuum and pump safety valves, Ø 100 mm vacuum and pressure gauges and a tank cleaning device. The trailer has traffic lights, pneumatic brakes, Ø 90 mm towing ball and ladder. 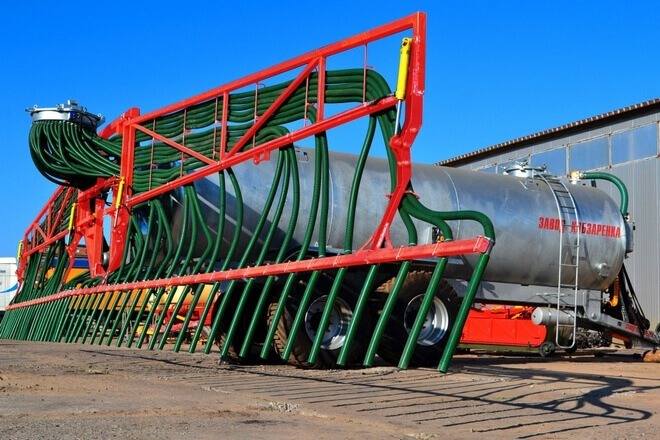 Optional equipment include a fertilizer spreader (moves up and down, from right to left), a hydraulic top hatch, a tank with a bottom mixer, shredder, Ø 40 or Ø 50 mm drawbar eye, plugs for 5 pairs of hydraulic connections, a cardan (Bondioli & Pavez), a cultivator coupling and a soil transfer device (with a shredder or a crusher). 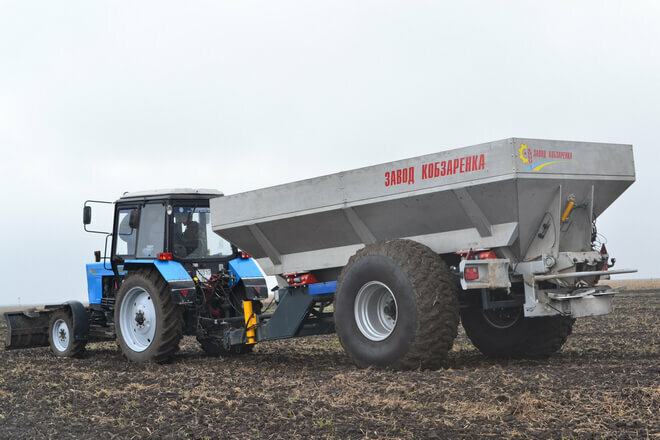 The walls of the mineral fertilizer spreader have a big angle of inclination, which ensures the flow of the fertilizer even when working on steeper surfaces. Wide tires reduce soil compression and provide better permeability. Stainless spreading disks (adjustable blades, Rauch, Germany) are driven by the trailer’s wheel, by hydraulics, or in case of a higher norm – PTO. The hydraulic equalizer (Bondioli Pavesi, Italy) ensures a constant speed of the spreading discs - irrespective of the speed of the PTO shaft or speed, the required rotation speed is ensured. The discs can be ordered Ø 400 mm or Ø 600 mm to ensure a uniform distribution of fertilizer (up to 24 m). The fertilizer norm is regulated by means of a hydraulic hatch and transported through a chain conveyor. 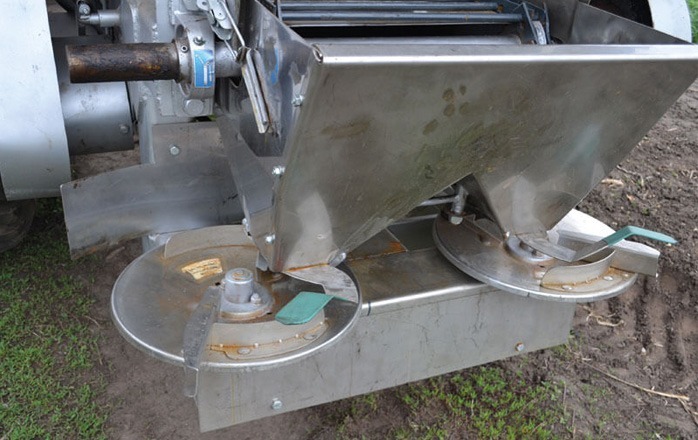 The construction of both the conveyor and the spreading discs ensures that chunks of fertilizer are crushed into granules but leaves granules intact. The trailer has either pneumatic or hydraulic brakes, Ø 50 mm towing eye, and the drawbar has a mechanical support leg. Stainless steel case, PTO option, a hydraulically driven support leg for the drawbar, and a load cover system can be ordered as extra equimpent.